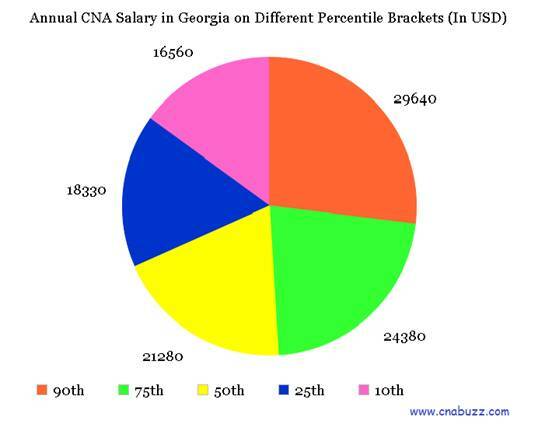 CNA salary in Georgia depends on a number of factors. Advance education and additional certifications can boost-up the earning potential of an aspirant. In May 2013, (according to the reports of the Bureau of Labor Statistics), the annual mean pay in the state was $21,910, with mean hourly wages of $10.54. Approximately 37,430 nurse aides were employed in the state in May 2013, and employment per 1,000 jobs was 9.65. As per the data of indeed.com, average CNA salary in GA was $28,000 (as of December 2014). These salary figures were 14% higher than the average CNA salaries at the national level. 90% of CNAs were offered less than $29,640; 10% were offered more than $29,640. 75% of employees earned less than $24,380; the remaining 25% earned more than $24,380. 50% received less than $21,280; the rest of 50% received more than $21,280. 25% of CNAs were salaried less than $18,330; 75% were paid more than $18,330. 10% of employees made less than $16,560; 90% were made more than $16,560. It can be easily concluded from the below given table that the highest cities in the state were Atlanta, Macon and Roswell, providing median annual salary $30,959 and median monthly salary $2,580. Valdosta is the lowest paying city with median annual salary $25,393. The Median Hourly Salary in the city ranges from $12 to $15. There are different titles allotted to the certified nursing assistants according to their working experience and level of education. The designation plays a significant role in the salary calculation and acquiring other benefits. The following table gives the pay scale of nurse aides posted on different job titles. CNA Hospice received $36,000, while CNA Rrmc was paid $34,000. The income of other professionals was reported to vary from $17,000 to $33,000. The remarkable growth in the nursing sector has resulted in massive job opportunities, especially for the CNAs. The demand of nursing assistants is not only limited to the hospitals, but doctors’ offices, rehabilitation centers, home care facilities, etc., also have huge job postings for these professionals. According to various surveys, the demand of nurse aides is getting higher every single day. The Bureau of Labor Statistics has also forecasted a growth of 21% in the employment of nursing assistants between 2012 and 2022. Question 1 – Can anyone suggest me some best paying nursing assistant job titles in the state of Georgia? Answer – According to indeed.com, CNA Hospice tops the highest paying job title in GA with the annual income of $36,000.Other top paying job titles include CNA Rrmc, Medical Assistant Family Practice, CNA Medical Surgical, CNA Float Pool Riverbend, and CNA Neurology Riverbend. Question 2 – At present, I am employed as a CNA in Delaware and I am planning to shift in Georgia. How much income can I expect? Answer – You can expect an average annual income of $28,000 in the state of Georgia.